Two Emmy Nominations for WIDE ANGLE! WIDE ANGLE’s Lord’s Children and Birth of a Surgeon are nominated for Emmy Awards! “It’s an honor to be nominated for an Emmy, especially in such fantastic company, with our colleagues over at Now, Worldfocus, Frontline, P.O.V, and Independent Lens,” said Pamela Hogan, Executive Producer of both films. 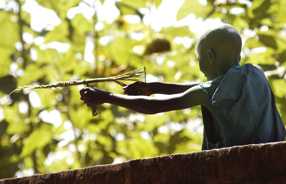 Lord’s Children, by Oliver Stoltz and Ali Samadi Ahadi, tells the story of three former child soldiers who fought in Uganda’s Lord’s Resistance Army, escaped from the bush, and have since taken refuge in a rehabilitation center. Birth of a Surgeon, by Karin Falk and Loui Bernal, travels to Mozambique where, for the first time, midwives are being trained to perform Cesarean sections and other life-saving surgery, significantly reducing the country’s maternal mortality rate. Coincidentally, Birth of a Surgeon is scheduled to be re-broadcast this week (check your local listings for airtimes). 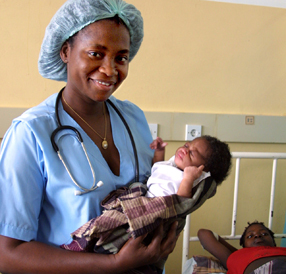 For the encore presentation, host Aaron Brown travels to Mozambique to check in with the film’s main character, Emilia Cumbane, one of the first midwives to go through the training program. She is now the head of the maternity ward at a rural hospital. The Emmy Awards will be presented on September 21st. Both Lord’s Children and Birth of a Surgeon will compete in the category of Outstanding Coverage of a News Story — Long Form.